This is your chance to visit the University of Plymouth and find out about the range of postgraduate and professional development opportunities that are available to you. Both academic and professional support staff from the University will be available to answer your questions and give you advice, guidance and information about our programmes. There will be a wide range of faculties, departments and services exhibiting at the open evening, with stands covered throughout the evening by academic and professional staff to answer your questions. The evening will consist of welcome talks, finance talks and subject-specific talks to provide you with all the information you require to choose the right postgraduate programme to meet your needs. Make sure that you check your emails regularly – a full programme will be emailed to you one week prior to the open evening and will also be available on the website. 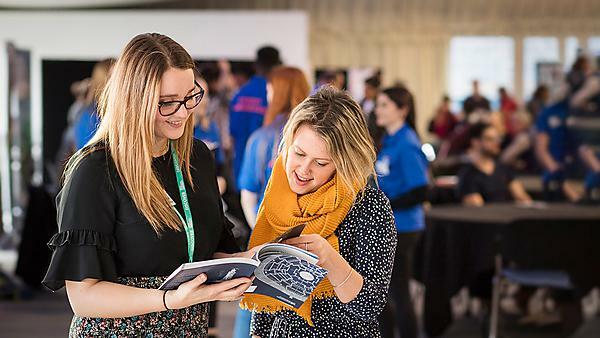 Our postgraduate blogs give you an insight into what it is really like to be a postgraduate student at the University of Plymouth. Please note that our list of exhibitors is subject to change. Check back regularly for the most up-to-date information. You could be eligible for a government loan of over £10,000 to help towards the cost of your masters degree. You can find out more about the postgraduate loan scheme on the FindAMasters website. Whether you choose a taught masters programme, or undertake a research degree or professional doctorate, you will be supported and supervised by staff who are international experts in their field. An essential aspect of the University's lively and enterprising culture is our community of postgraduate students. Following our postgraduate open evening events, we send out surveys to all students to gain valuable feedback about their experience. To say thank you for taking the time to complete the surveys we enter all participants into a prize draw to win a £40 Amazon voucher (one per student).